TenguLife: The curious guide to Japan: Where did the Koinobori go? Japanese national holidays tend to be themed. There's Sports Day, Respect for the Aged Day, Marine Day, Coming of Age Day (my personal favourite) and several more. Today though is officially known as Children's Day (kodomo no hi), a name it was given in 1948. Unofficially though it's known as Boy's Day and is largely celebrated by families with young boys rather than girls (there is a separate unofficial Girl's Day later in the year). 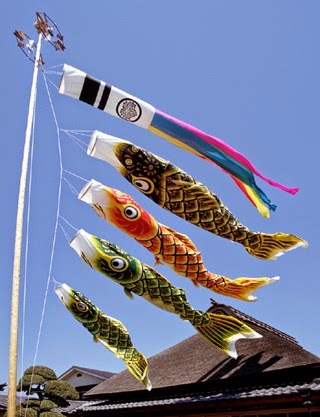 The day is traditionally celebrated by flying koinobri, large carp like streamers. These would be flown from roof tops across towns and cities, the number dependent upon how many boys there are in the family. The top streamer represents the father, the next the mother and then one each for the boys. My neighbourhood in central Tokyo used to have many families proudly flying their koinobori. As I walk around today there are none. I wonder to myself if this is a sign of changing times or a sign of an ageing population. Whichever, the neighbourhood used to be a brighter place on Boy's Day.